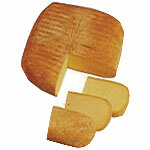 Mahon comes from Menorca.The taste is very particular, slightly acidic and salty, but not buttery. It can be milky and humid when fresh, and dry, strong and piquant as the aging grows. Made with unpasteurised cows milk. Produced in the Region of La Mancha.This is the most well known of Spanish cheeses. With its distinctive rind made from the traditional use of esparto grass molds which imprints a zigzag pattern along the side of the cheese. Intense and robust flavour. DOP. Made with unpasteurised ewes milk.